I'll never bag all the Munros, and nor really do I want to. 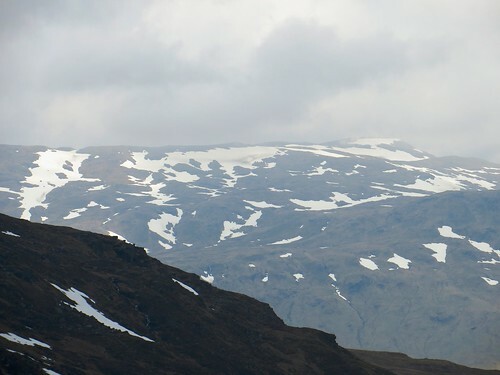 My interest is in snow, and the monitoring of it throughout the year on the hills of Scotland (and to a lesser extent England and Wales). As such, most of my spare time is taken up venturing to places where others don't, and picking my way in and out of some pretty inaccessible places. That said, it's a bit early in the year to worry about what snow is going to make it through to next winter. That being the case, I thought I'd venture up to Breadalbane and do a couple of handsome hills that I'd often passed, but never been on. Not only would this be a good way of working off the waist-expanding 2000 calorie pizza I devoured the night before (triple cheese and stuffed crust: oh boy), but would give me a good understanding of the amount of snow that fell on hills that hold snow longer than most. 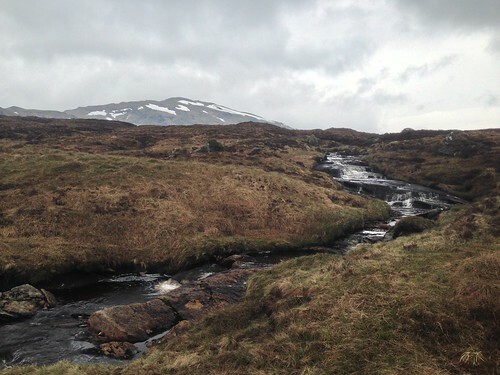 Namely: Beinn Heasgarnich and Ben More. Being the owner of a decent set of Brasher and Scarpa boots, I spat my pineapple cake out in laughter when I read somewhere that the walker who attempts these two hills from Glen Dochart should expect wet feet. Having now walked to the top of Meall Glas and Sgiath Chùil, the author of this statement underplayed it. When I say 'underplayed it', he/she would have done better to recommend wellies and - frankly - a snorkel. 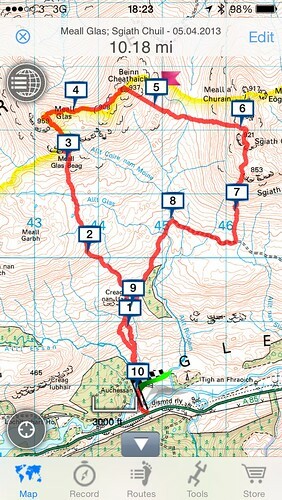 All this is not apparent in the very pleasant walk from Auchessan, just off the A85. I was practically gambolling across the bridge, emulating the cute lambs that were all around me in the fields. A nice dry start. 'It can't be that wet, can it?' Well, yes. By the end of mile 3 I would not have been surprised to find a mummy and daddy amphibian raising a family in both my boots. But wet feet are only a minor annoyance, so I battled on manfully. 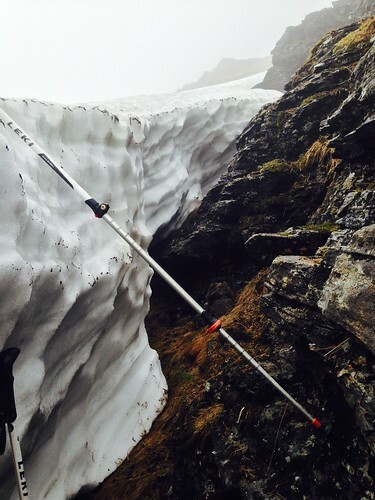 I encountered similar conditions last year on the walk up Beinn Heasgarnich. That remains the most arduous day's walking I've done for a hill which is so close to a road (Ok, it's not that close, but it's not the Cairngorms or anything). I don't know what it is with Breadalbane, but I'm sure it'll be the last place on earth to run out of water. Lake Baikal may give it a run for its money, but my cash's on the Giant Scottish Sponge. The first real snow encountered was on the SE flank of Meall Glas (around here), and it was mighty impressive in its length and depth. 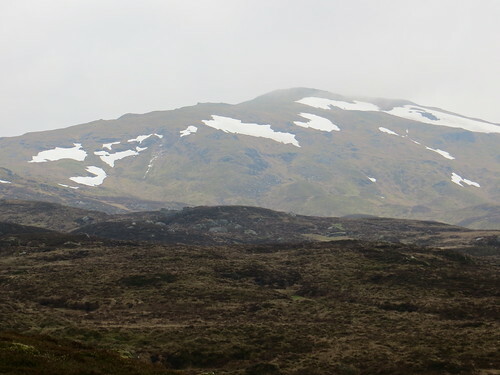 The summit ridge is actually shorter than expected, and before long I was striding to the summit of Meall Glas, just as the cloud lifted. Predictably, I took some photos of snow. 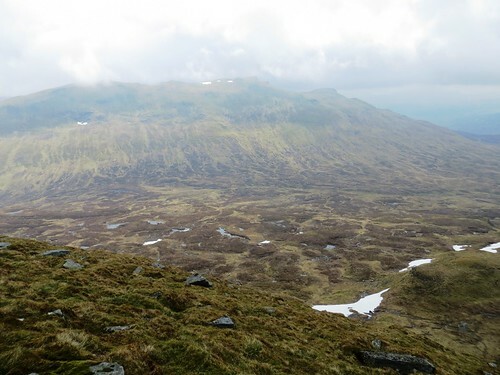 The walk along the ridge from Meall Glas to Beinn Cheathaich is very pleasant indeed. I was lucky enough to see the cloud swirl in and out, covering me and then blowing off like steam dissipating from a kettle. Add to that the fact that I hadn't seen a soul all day (and, in fact, didn't the whole day) then it was tremendously peaceful and a little bit unsettling. But in a good way, if that makes sense. 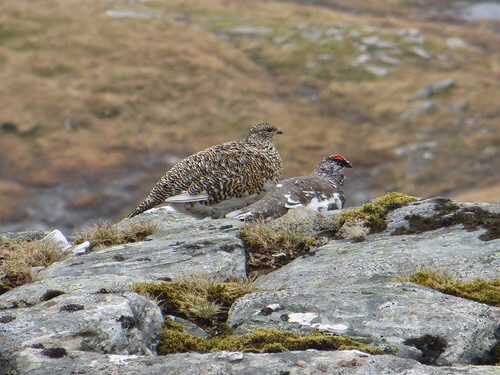 The icing on that particular cake was the pair of ptarmigan I saw on the ridge. And this time I got a good photo! Thank God. Every time I try to snap them the photos end up looking as though they were taken by someone who's just come out of a 5-day bender on the Carlsbergs. My joy was to be short-lived, naturally. From the summit of Beinn Cheathaich, the next stage of the journey is displayed in glorious Technicolor (TM) in front of you. You drop, you bog-hop, you climb. But where do you drop? And where do you climb? The bog-hopping bit was easy, as my feet were so wet at this point I thought about taking my boots off and pouring the contents into my depleted water bottle. The steep ascent of Sgiath Chùil wasn't a concern, really. Looking across at it, it struck me that slopes always look steeper when you're looking at them from above. The reality is that they're not that bad when you're close up. 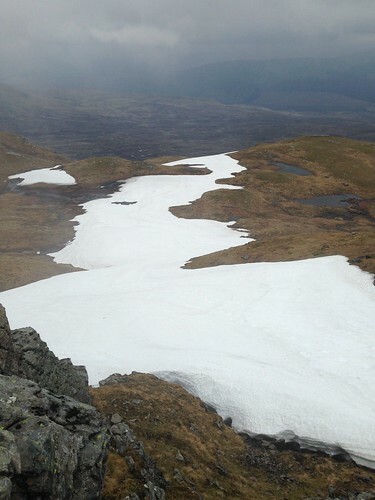 The biggest issue was how to get off the slop of Beinn Cheathaich. 'Hmm. Bugger it, let's just head straight off and see what happens' was my approach. And it worked. 15 minutes or so later and I was into the moine (i.e. bog), and dancing across it like a little pixie who was trying to catch something that little pixies like to catch. The slope up Sgiath Chùil is pretty unrelenting (Ben More-esque, but steeper), but that's the way I like it. Steep means quick, if you've the fitness. The 1000-odd ft of ascent was dealt with in a matter of 20 mins, and from there it was a straight skip to the (windy) summit. A change of top was bested only by a macaroni cheese pie and rocky road for afters. A magnificent feast when you're wet and tired. At this point Ben More started to show himself (yes, I'm calling it a 'him', as it's pretty masculine. I'd say Stob Binnein is female, which compliments it well). 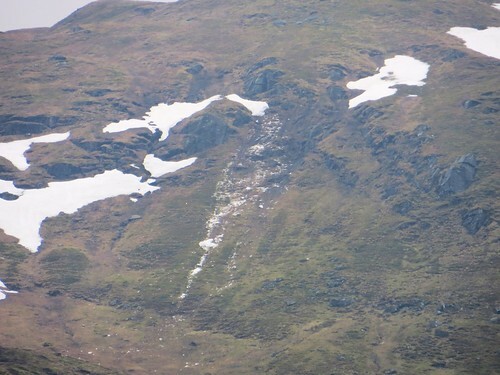 More especially, the Cuidhe Chrom was visible as a massive expanse of snow. 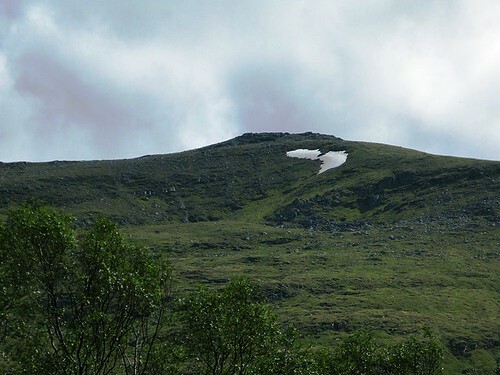 This feature, one of the few named snow-patches in Scotland, and only one of two to be named on a map (the other is, curiously, Cuidhe Chrom on Lochnagar), is so-called because of its Gaelic meaning of 'crooked wreath'. In late spring and summer it develops a distinctive crooked appearance, and is very conspicuous from Killin, right up Glen Dochart. The descent back to the car was more of the same. Boggy bog and boggier bog. I did utilise an SSE maintained metalled track for a spell, but that led nowhere. Alas. All-in-all, I enjoyed the day for its splendid isolation and wildness. I'm not sure I'd do it again from Glen Dochart. 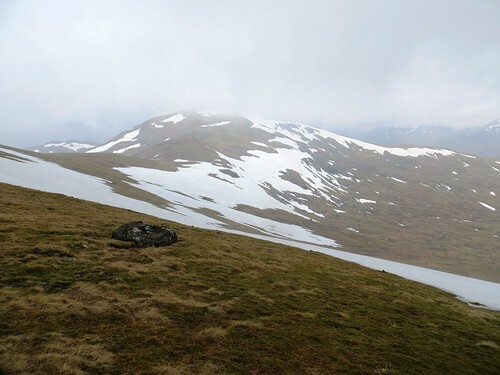 The ascent from Glen Lochay is probably easier, if less scenic. I always dislike seeing the mess on the hills around there. Kenknock is a bit of a scrapyard, and the pipes on the hills around there are intrusive. I just took the boots out of the boot of the car. The smell was unimaginable. I thought only dead folk smelled like that. A hairdryer may now be too little too late. Was up Sgiath Chuil last June. It was so wet (underfoot and overhead) we pulled the plug on Meall Glas and probably won't be back. Ah you need Yetis.. I've never had wet feet with them, and I've waded rivers!